On Feb­ru­ary 20 at 3pm at the Bell and Barter The­ater in Rock­away, New Jer­sey, Richard D. Rus­sell will pre­miere sev­eral new pieces: “Three Part­ings” with texts by Lord Byron, “Are You Dig­ging on My Grave?” based on Thomas Hardy’s humor­ous poem, and “Amid the Blind­ing Snow” based on a poem by Elis­a­beth Sid­well. The con­cert is being pre­sented by In Mid Air Pro­duc­tions. 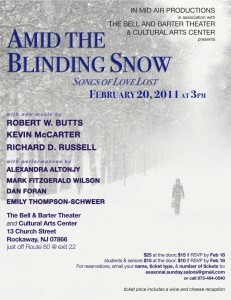 The con­cert will also fea­ture music by Robert Butts and Kevin McCarter.